With any company, executives are usually carefully chosen from the ranks of brown-nosing ladder-climbers, not talented automotive visionaries like the designer of Honda's NSX all-aluminum chassis. That hasn't stopped Takanobu Ito from just becoming Honda President and CEO. The Honda NSX is still rightfully considered one of the best handling and most important super cars of all time. It's the car that's responsible for all the reliable, easy-to-drive, safe exotics that rich d-bags are blessed with today. Before it, cars like the Ferrari 348 were slow, caught on fire even more often than Ferraris do today and actively tried to kill you not just through a lack of safety equipment, but through vile, unpredictable handling. Then, in 1990, a Japanese economy car maker brought out a mid-engined super car that was fast, went around corners like no car before or since and, hold onto your hats, didn't break down, ever, and was easy to drive. To survive, Ferrari, Porsche, Lamborghini etc all had to follow suit. 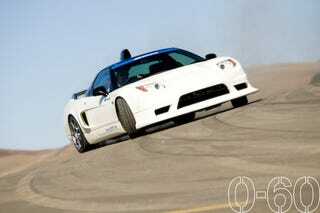 In my book, they still haven't surpassed the original NSX's driving prowess. It made do without any traction or stability control or any unnecessary complication, it was just the super car ideal distilled to its essence. Last year I drove the Spoon Honda NSX-R GT (pictured above), the ultimate evolution of the NSX, and found it to combine everything that was great about the original car - peerless, exploitable handling - with modern performance - 420 HP pushes just 2,795 Lbs for a sub-4-second 0-60 time. Takanobu Ito was part of the team that built the NSX, in fact, he designed the extruded-aluminum chassis. Last week he officially took over the reins of Honda. Hondas of late have been missing that fundamentally right simplicity that was so evident in the NSX and in cars like older Accords, Civics and Integras. Now, the Accord is overcomplicated, overweight and overly ugly while other cars in the Honda lineup lack the inspiration of their predecessors. Will Takanobu Ito help return Honda to its roots? As Honda fans, we sincerely hope so.